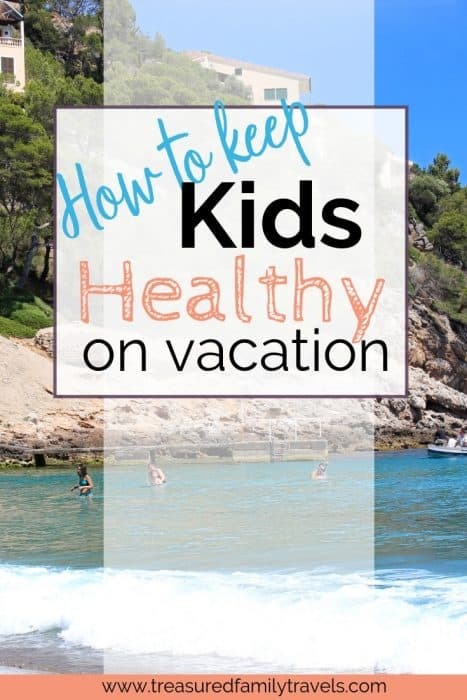 Do you worry about how to keep your family healthy when traveling? 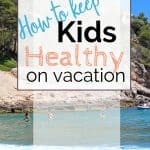 Do you worry about them getting sick before vacation? 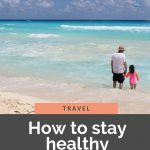 Here are 7 ways to stay healthy while traveling. With the amount of traveling we do, staying healthy is always at the forefront of my mind. However, I have found some tried and true combinations that work for my family. Hopefully, some of these will work for your family too. I am not a doctor, nor do I pretend to be one! Be sure to ask your pediatrician if you have any medical questions regarding if these are right for your family. I am a firm believer in plenty of sleep. It doesn’t matter where we are – Disney, Europe, Asia, the beach – I make sure that Little K gets at least 9 hours of sleep, preferably 10. Yes, I am that strict! You need to sleep so your immune system can work efficiently. When you have an efficiently working immune system, there is a better chance that your body will fight off bacteria and viruses that may get you sick. Napping in a hotel room on vacation. I carry my essential oils with me wherever I go. They help strengthen the immune system when traveling as well as to try and stop any sickness from spreading. Immune Boom – this is a synergy designed for children by Plant Therapy. To me, it smells like pickles because it contains dill weed and I despise pickles! But, it seems to work, so I don’t complain too much. I apply this oil before we board a flight or anytime we will be in close contact with a lot of people. Finger Root – this essential oil is part of the ginger family. If an upset stomach occurs, or even constipation due to travel, I dilute a drop of finger root in a tablespoon of fractionated coconut oil and massage it gently around her (or my!) belly button in a clockwise rotation. I do this for about 5 minutes. So far, it hasn’t let me down! Germ Destroyer – this is another synergy from Plant Therapy. I use this one after we have come in contact with a lot of people. If she picked up anything, this oil will help reduce any chance of sickness. Calm the child – Little K actually asks for this blend! We use it when she is hyperactive (like after a day at Disney) and it calms her down. This particular blend I want her to smell, so I put it on her neck after I have it diluted in coconut oil. Tea tree, Lavender, Palmarosa and Frankincense – my standby oils! These are anti-bacterial or immune stimulants. Lavender is great for any type of bug bite. It is also very calming. Cedarwood and Sandalwood – these are my go-to oils for congestion or a sore throat. These would be rubbed on the chest and throat after diluted in carrier oil. Yes, I take all of the above with me on every trip! Three of them fit in my quart-size bag of liquids while I pack the rest in my suitcase in an essential oil case. We drink plenty of water. Little K is not allowed to have soda, although her dad does sneak her some at times! We also limit her juice intake because it’s full of sugar. We encourage her to eat an orange or an apple instead. Besides keeping you hydrated, your cells and blood need water to function properly. All of this supports a healthy immune system. We generally purchase bottled water while we are traveling. Also, keep in mind that in some countries it is not advised to get ice in drinks or eat any produce that doesn’t have a skin on it. It could just be me (my husband says it is), but I hate walking around on someone else’s carpet or floor in my bare feet. I don’t know when it’s been cleaned or what could have been spilled on it. For this reason, I take socks dedicated to wearing when we have our pj’s on. Along the same lines, I don’t understand how parents have their kids (or even themselves) walk through a hotel without shoes on. You never know what you could be walking on! Don’t do it. We love our fuzzy socks like these with grippers on the bottom. I start to give my daughter these gummies that provide extra vitamin C and zinc a week before we leave. Then, she continues to take these while on vacation. While we strive to wash our hands diligently at home, we are more particular about it on vacation. When we’re opening doors, putting our hands on escalator and stair railings or even pressing elevator buttons, we are exposing ourselves to more germs. I do carry anti-bacterial wipes with me but would rather wash our hands with soap under warm water making sure to wash them an extra long time. I take my same anti-bacterial wipes and clean the armrests of trains or planes immediately after we sit down. In addition, I will wipe the tray table as well as the button to release the tray table. Basically, anything that can be touched! Did your mom ever tell you this? Mine did! She told my daughter too. I try and remind us to use our knuckles to press elevator buttons, but I do forget a lot. I just think of people sneezing or coughing into their hand, then using that same hand to press a button, however I realize there is only so much you can do though. If I left this one off, I wouldn’t be telling you my favorite anti-sickness protocol. 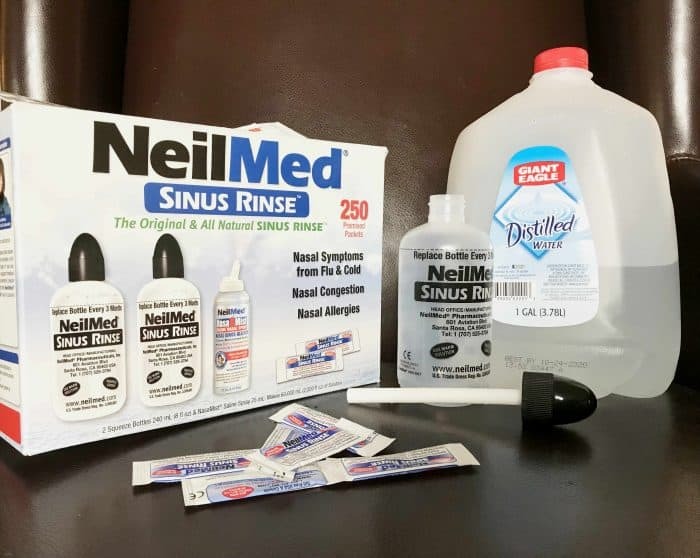 A saline flush of the nasal passages. Yes, my daughter does this herself. Now. But, it wasn’t easy to get her to do it! She screamed so loud at first (we were in a hotel in California), my husband thought security would be at the door. A saline flush will help rinse away bacteria and viruses that could irritate your respiratory tract. Little K’s pediatrician suggested we use this method anytime she has a cold instead of reaching for decongestants. We decided to try it last year and we have had great success since. During allergy and cold season, we do this once a day as a preventative measure. There you have it! Those are my 9 tried and true formulas for staying healthy while traveling. Some people may say that is a lot of work. I agree it is. However, I believe it has helped immensely. I am very diligent about our health and continue to learn more about how to stay healthy. When you are on vacation, the last thing you want to do is get sick! I feel so sorry for my little one when I see her sick as I’m sure you do as well with your kids. As a mom, I feel it’s my job to keep her healthy in the ways I know how. The above plan has worked for me so far! 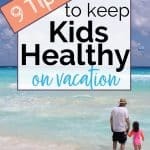 Here’s hoping all of us can stay healthy on vacation. 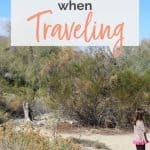 Do you worry about forgetting to do things at home before your trip? Get this handy pre-vacation checklist when you subscribe below! Any healthy tips you would like to share? 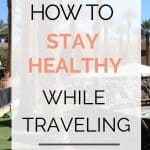 What do you do to stay healthy while traveling? Please PIN this article to share with others! Thank you. I always try to remember to bring good fuzzy socks with me for hotels & AirBnBs. I bought a cheap pack of them on Amazon so I don’t mind if I lose one in a hotel bed or leave them behind. Exactly! You can never have too many and who cares if they don’t match if you are just wearing them inside. Thanks, Briana! Enjoy your travels! Great advice! I try to keep wipes on me too, especially for planes. And I’m always terrible with getting enough sleep. I’ll have to try out the essential oils though! Thank you for sharing.